HP has joined the Android tablet crowd with a launch of the Slate 7 just prior to Mobile World Congress officially getting underway in Barcelona. The 7-inch device will be released in April running Android 4.1 Jelly Bean, and will battle the likes of the Google Nexus 7 and Amazon Kindle Fire with a competitive $169 price-point. However, it may struggle to compete with those big hitters in terms of specs, with a 1.6GHz dual-core Cortex-A9 processor on board rather than the Tegra 4 device hinted at in recent weeks. The 7-inch device also offers a slightly low-resolution 1024 x 600 multi-touch screen, 1GB RAM and 8GB of built-in storage which can be augmented by a micro SD slot. The Slate 7 also brings a 3-megapixel rear camera and a basic VGA front-facing offering, while the device measures up at a respectable 10.7mm thin. It's also the first Android tablet to have Beats Audio integration. The tablet will launch in stainless, steel, black and red and also promises five hours of movie playback from the battery. 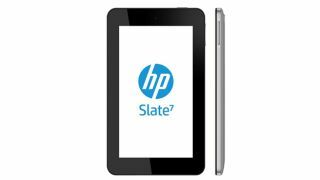 HP will hope that the Slate 7 endures a more successful shelf life than the ill-fated HP TouchPad tablet running WebOS. The device will be fully unveiled on the show floor at MWC this week, and we'll be out there in force to hopefully bring you some hands-on time with the device. We'll also update this story with international pricing details as soon as they are confirmed.